Colorado solidified its spot in the Old West the minute gold was discovered in Clear Creek. To this day, you can still see where prospectors mined, panned and enjoyed the spoils of gold. But nuggets aren’t the only type of gold you can discover here. Get your hands wet panning for gold along the middle fork of the South Platte River near Fairplay. Although commercial dredging stopped years ago, the river is open for panning with the proper permit. Follow the river downstream to catch the bigger nuggets as they get drudged up — with any luck you’ll come away with a cache of your own. Visit fairplayco.us/docsforms.html for permit information. Prefer to have the help of experts for your quest? Based in Denver, Goldstrike Adventures leads one-on-one or group expeditions around the same areas where explorers first struck gold in the mid-1800s. They’ll also teach you how to pan or sluice, show you the ropes of responsible searching and supply the latest equipment. For another take, descend into the heart of 13,000-foot Galena Mountain near Silverton for a tour of Old Hundred Gold Mine. You’ll ride a vintage, electric-powered mine train a third of a mile to witness real mining in action. 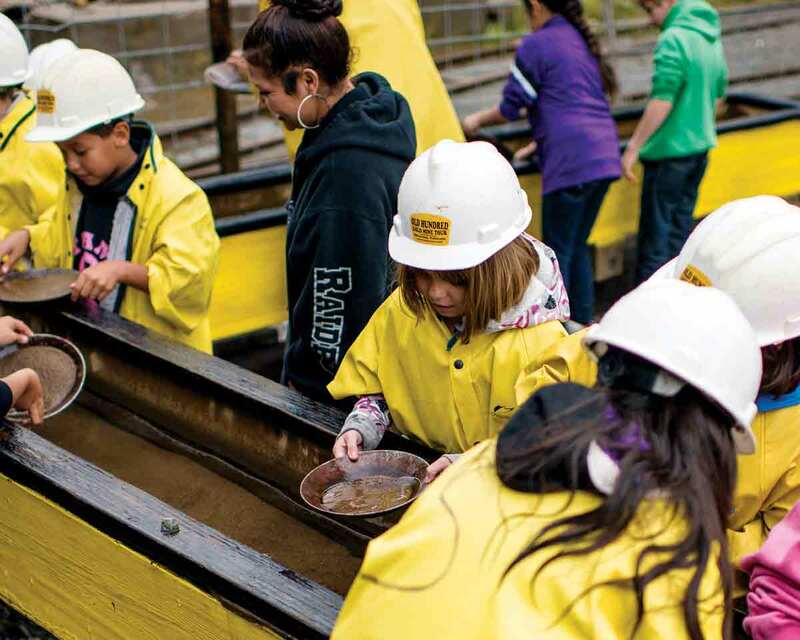 After the tour, you can try your luck panning for gold in the sluice box — and keep what you find! 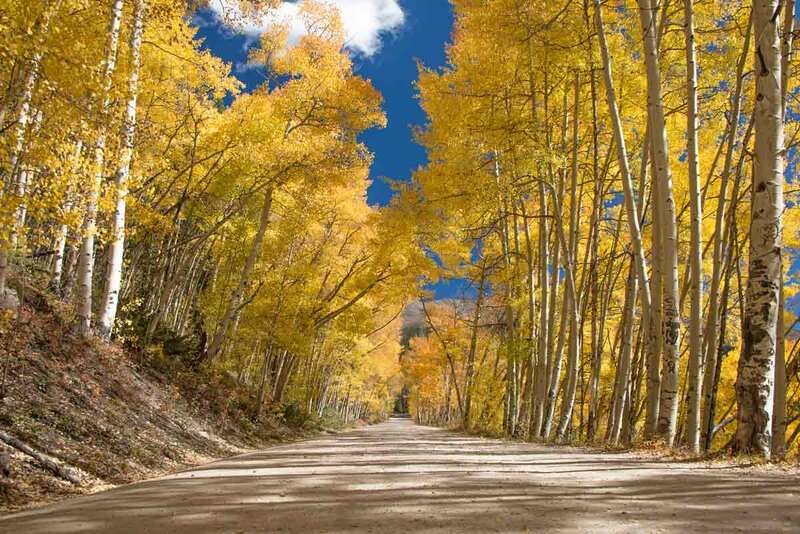 We can’t talk about Rocky Mountain gold without mentioning the troves of aspen trees that turn a brilliant, shimmering shade of yellow each autumn. And luckily, there are a variety of ways to soak up this splendor. Golden-based Big Sun Photo Tours offers single-day photography outings in the central Rockies between Denver, Vail and Aspen. Along with beautiful leaves, don’t be surprised if an elk or eagle makes it into your frame. Aerial views from the free Telluride gondola provide an amazing way to peep fall colors, along with a bird’s-eye vantage point of the town below, its box canyon and valleys lined with spectacular aspens and evergreens. An excursion on the Leadville, Colorado & Southern Railroad will leave you oohing and aahing as you wind through the aspen-filled wilderness of the San Isabel National Forest, up into the Continental Divide. Reserve a coach, engine or caboose seat, and don’t forget your camera! Or, immerse yourself in golden surroundings on a horseback ride. The equines at Granite Mountain Outfitters near Poncha Springs are gentle and sure-footed as you traverse trails showcasing panoramic views of the Sangre de Cristo and Sawatch mountains and San Luis Valley. Ever since the gold-rush days of the 1800s, folks have been trying their luck in Colorado. Try your hand at gaming in one of the state’s casinos — there are nearly 40 to choose from, and many are open 24 hours a day. Cripple Creek is a former mining town that has turned its fortune into more than 10 casinos. Most of the gaming houses reside along Bennett Avenue in historic buildings. You’ll feel transported to the Old West as you double down in blackjack at Colorado Grande Casino. Riches can still be found in the hills west of Denver — namely casino winnings in Central City and Black Hawk, an historic pair of picturesque towns. 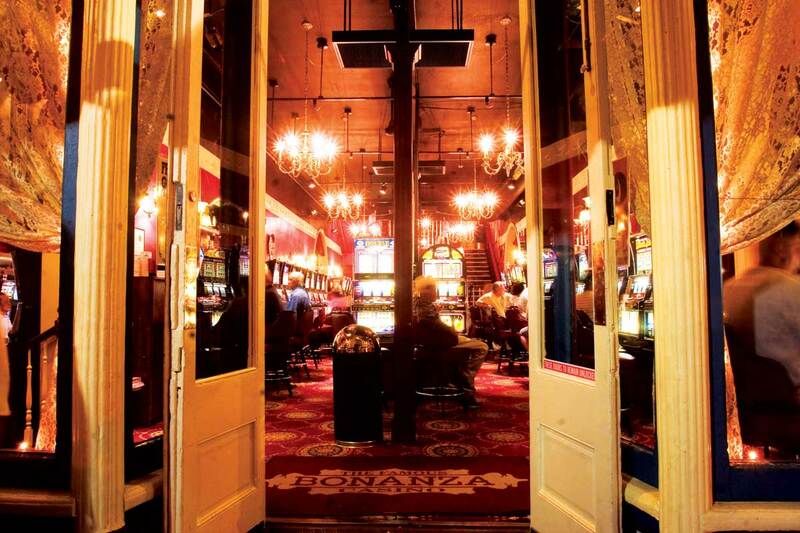 The former’s Famous Bonanza Casino features classic coin slot machines, while the latter’s Lodge Casino lures patrons with roulette, craps and more. The Four Corners region of southwest Colorado is home to both of the state’s American Indian gaming areas. Ignacio’s Sky Ute Casino Resort and Ute Mountain Casino in Towaoc are vacation destinations unto themselves, with each offering a complete gaming experience along with entertainment, dining and luxe amenities. Not all gold comes in bullion form. Our abundant craft-beverage scene ensures a variety of ways to quench your thirst. Gone are the days of Vikings and armor-clad knights, but you can still enjoy a swig of their favorite libation: mead. This sweet honey wine is often dubbed “nectar of the gods,” and you only need a sip to figure out why. Head to Palisade’s Meadery of the Rockies for a tasting of traditional sips or varieties blended with fruit, all made with 100 percent orange-blossom honey. Hailed as the second-largest brewery in Golden (the first is a little place called Coors Brewing Company), Golden City Brewery has been serving suds for more than 25 years. Grab a pint of Clear Creek Gold Kolsch and bask in the (yes, golden) sunshine outside in the beer garden. Caribbean mariners brought rum to Colorado during the Gold Rush for use as currency and water purification, and Montanya Rum Distillers in Crested Butte proudly carries on the tradition — though these elixirs are made for imbibing — with its barrel-aged, amber-hued Montanya Oro. 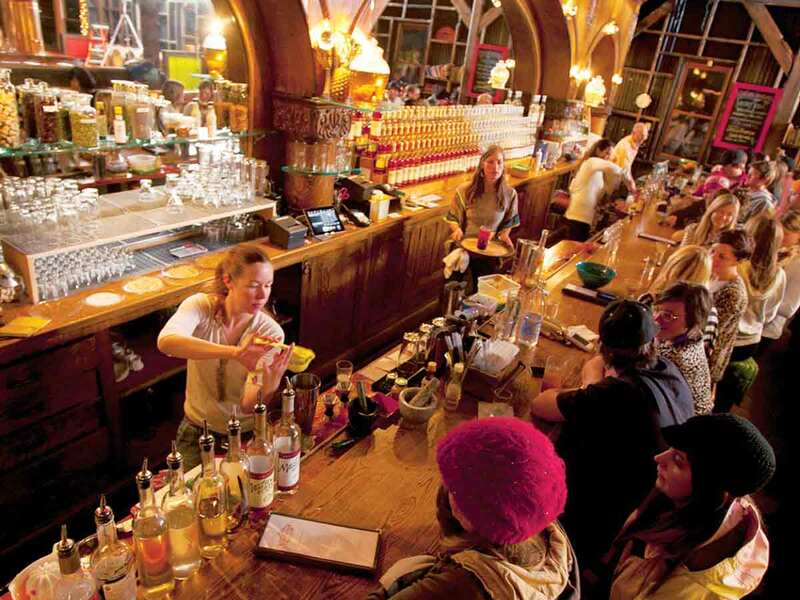 To get a deeper sense of boozy offerings in Colorado, tour the Colorado Spirits Trail. Established this year, the route includes more than 70 stops at craft distilleries, from bustling cities to snowy peaks. You can even collect stamps on your map (coloradospiritstrail.com) as you check each libation off your list.